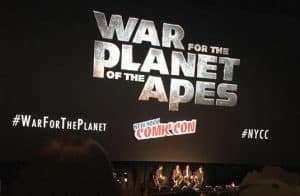 I attended the War for the Planet of the Apes special panel event they held at the Regal E-walk movie theater at Times Square on Thursday evening of New York Comic Con (NYCC). Now before I saw the panel, I hadn’t been keeping up much with the news on the movie. It was a little surprising that 20th Century Fox had decided to bring this film, since there were more comic-con friendly films coming out before that they could have shown. But I did had enjoyed the previous two movies, Rise of the Planet of Apes, and Dawn of the Planet Apes, very much, so I entered the lottery for this panel and a won ticket. The panel was supposed to begin at 8:30pm, so I arrived at around 7:45pm. There was another big line of people for this panel, from another company who gives away more passes then are available seats. But before I arrived they had set up a separate line NYCC fans, who were given blue bracelets by Fox. I just showed my ticket and got the bracelet. I showed my ticket to the security at the door and I proceeded into theater for the panel. Before we went inside the theater there were bag checks and metal scanners. They let everyone take their phones inside. But security was very strict on keeping cells phones turned off until almost the end of the panel. When I arrived inside the theater, there were many seats in front middle that had been reserved for press. Seats further back, on the sides, and closer to the screen were for the fans. The panel started a little late, at around 8:45pm. A billboard teaser that was released online was shown first. 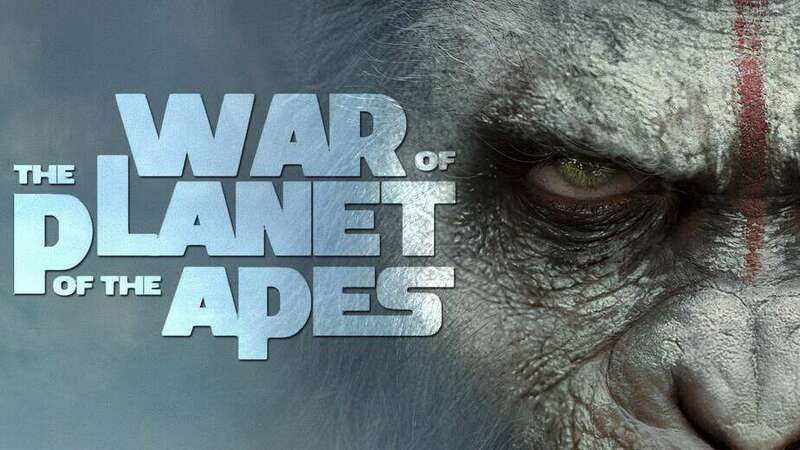 Then the film’s director, Matt Reeves, the producer Dylan Clark and motion capture actor Andy Serkis (who plays the main ape character Caesar) all came out in the front of theater screen to talk about the filming. First they showed a behind the scenes look at production and filming with some of actors on the sets. A lot of the movie was filmed on the snow. Then they showed 7 minutes of raw, unfinished footage from first act of the movie. Much of the footage actually showed the actors in their motion capture suits. I won’t go into a full description or spoil too much, but the scene featured the apes debating on whether or not to leave a young mute girl alone in small cabin they had found. Matt Reeves started talking about how he had been terrified of showing that footage. But he explained that he also wanted to show how much effort and emotion the actors put into their ape characters, particularly Andy Serkis and Karin Konoval (who plays Maurice, the other main ape characters from past two recent films)). Reeves talked about how performance capture was more than just motion capture. The panel ended with the film’s first real teaser trailer being shown. We saw and heard Woody Harrelson, in his role as the Colonel, as he narrated about this world becoming the Planet of the Apes, if they wouldn’t take more action to prevent such. There is one scene in the trailer starts out with Caesar coming up and than stopping behind the Colonel on top of a cliff, in front of a waterfall. The Colonel slowly turns around and a close up of his face is shown, covered in black paint or oil. Then Caesar starts to yell and run up to him, as the Colonel begins to draw some type of machine gun and shoot aimlessly at him. There was another scene that showed the Colonel shaving and shirtless. Then armies of men were depicted walking down bridges when explosions where going off. Matt Reeves also pointed out that this is the first Planet of Apes movie that was shot mostly in the snow. I had a good experience overall with this panel. I wasn’t surprised by the security procedures and was willing to hand over my phone during the panel, if that was what they had wanted. As for the panel itself, I would have liked the 7 minutes footage we were shown to have been more finished, and accompanied by more action footage. But considering that the movie doesn’t come out until July 2017, I was very satisfied with what I saw, at this time. I am looking very much forward to seeing this film next year.